The share of remote workers in the modern workplace has been on the rise for quite some time. In recent years, many of these remote workers have traded their kitchen table or coffeeshop counter workspaces to lease a spot at one of the now commonplace coworking spaces. Dubbed the future of work, the first generation of the coworking empires which cropped up in the early 2000s – WeWork, Industrious and RocketSpace – were noticeably all run by men, with male-dominated boards. As for the workplaces themselves, it soon became apparent that their designers had turned a blind eye to essentials working women needed. The workplace had moved lightyears ahead, but even in this hyper-modern era, women were still being left behind. 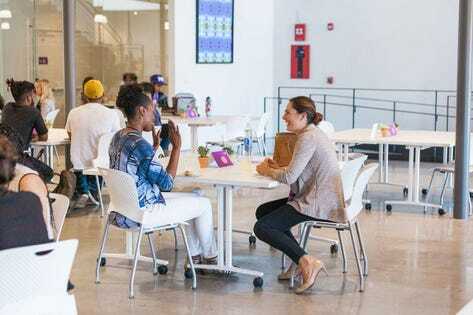 Today, just as the dot com era gave rise to these first generation coworking spaces, the #MeToo era is now setting in motion a new kind of coworking space that carries a female friendly promise to those that pay their membership dues. Perhaps the most well known of these “for women, by women” workspaces is The Wing, a no-boys-allowed social club and coworking space that has quickly grown to five locations – with six on the way. In just a few years, the brand has gained serious publicity and capital. In March of 2018; however, it began to make headlines that invited some new criticism of its business model as The New York City Commission on Human Rights launched an investigation into whether The Wing was violating a local law prohibiting gender-based discrimination against potential customers. Despite the investigation, founder Audrey Gelman has stood by The Wing’s initial premise to offer a safe place for its female members. Since then, after considerable pushback, the commission has backed off on their investigation but the question has continued to hang over The Wing and its similar coworking havens: should admission criteria include a check on gender identity? Two women who founded female-focused coworking spaces that do in fact allow men as card carrying members weighed in on their decision to remain gender inclusive. The Riveter, which recently closed a $15 million Series A funding round, currently has five locations across Seattle and Los Angeles and is described as “a membership network built by women, for everyone.” It’s female-founded and the workspaces are female-focused by design but they welcome not only women but also men and gender fluid individuals. In fact, today they boast quite a few members that don’t identify as female – 25% to be exact. Former corporate litigator, Amy Nelson founded The Riveter because she, like Gelman, believed in creating a better work environment for women. That being said, she believes that any strong movement needs allies and she doesn’t want those allies to be stuck outside – she wants them in the room serving as active participants in the conversation. “From the beginning, we have always wanted to be an inclusive and open community. We believe that we have a platform to advocate for increasing opportunities to grow and to truly redefine the future of work for all. Women are often left out of those conversations, and while females have more of a seat at the table today, we don’t always have the space to be heard. At The Riveter, we want to drive the conversation on how gender equality is not a ‘nice-to-have’ item on a checklist – it is a must-have. At the core, we are changing conversation on how to support women in the workspace so that they can be successful and equity can be achieved. Men and gender-fluid individuals must be a part of that conversation as the future of work depends on their support and input,” explains Nelson. Hera Hub is another female-centric yet co-ed coworking space. Founded in 2011, several years ahead of The Wing and The Riveter, the organization now boasts six locations internationally. Much like The Riveter, Hera Hub decided not to exclusively green light female membership hopefuls and its founder Felena Hanson feels strongly that it was the right decision for the organization. “Being pro-women doesn’t mean you need to be anti-male. Yes, the pillars of business were developed by men – competitive nature and sometimes aggressive tactics – and women have often felt like outsiders but reverse discrimination is not the way to make it right. Our goal is to create spaces where women feel safe and supported, where women know it’s okay to not have all the answers and they are open to sharing and asking for help. We absolutely need men to be part of the conversation if we are going to create real change,” explains Hanson. She believes the men who have signed up for Hera Hub – who currently make up 3% of the membership base – are attracted to the spaces for the same reason women are: practicality, convenience but also due to the sense of community created at Hera Hub. “I recently had a male member say, wow, it’s so great to see how you all really support each other. I wish men would do the same,” recalls Hanson. There are a lot of nuances and sticky questions to be considered when it comes to breaking down the pros and cons of gendered coworking spaces. Does the benefit of offering a safe space for women at a time when workplace sexual harassment seems so prolific outweigh the potential harms of offering something that not everyone can have access to? Is it antiquated to focus primarily on gender and risk discounting non-binary individuals when society is pushing for a more fluid interpretation of gender? And what might people think of these spaces if the admission guidelines were swapped and men-only coworking spaces began to pop up across major metros? For now, with no definitive answer to the question of whether or not these women-first coworking spaces should ethically, and perhaps even legally, allow men within their membership ranks it seems there exists an option for those of all camps. Should you have the funds and reside in a large enough city, chances are you’ll be able to find standard coworking spaces with a fairly even distribution of men and women, female-focused co-ed spaces like that of The Riveter and Hera Hub and true “no mans land” options like The Wing to choose from.